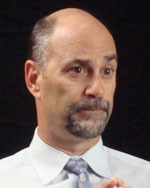 Frank Scandale has been editor of The Record since January 2001. Under his guidance, the paper has earned The New Jersey Press Association’s General Excellence Award for best newspaper in the state, 7 of the last 9 years. He led The Record’s award-winning coverage of the September 11 attacks, which included the photo by Thomas Franklin of firemen raising the flag in front of the World Trade Center rubble. Scandale came to The Record from The Denver Post, where he served as assistant managing editor for news. He was previously the city editor for Daily Journal in Elizabeth, NJ and also held editorial positions at Reuters News. He is a 1979 graduate of Glassboro State College. Frank Scandale, V.P. & editor, The (Bergen) Record, says the Record uses the SPJ Code of Ethics. Scandale says, as the editor, he makes the calls about what goes into the newspaper and what does not. “I think I’m paid more for my judgment than anything else at this point,” says Scandale. Frank Scandale, V.P. & editor, The (Bergen) Record, says two big changes in recent years at his newspaper were the establishment of a web desk and the creation of multi-media editor position. Scandale says The Record covers the news, 18/7, with fulltime staff, and he expects the newsroom will be staffed fulltime, 24/7, before too long. Frank Scandale, V.P. & editor, The (Bergen) Record, says there are still many opportunities in journalism and that students can even start their own news-oriented websites to launch their careers.